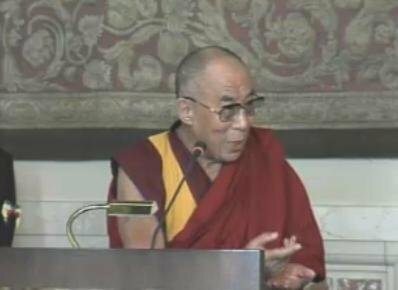 The Dalai Lama, living in self-imposed exile in India, addressed in a recent speech the significance of the Tibetan issue and emphasized the need for a constructive dialogue with China. The Tibetan spiritual leader, the Dalai Lama, said Friday [10 January 2014] that the Tibetan community is passing through a difficult phase, but lauded the Chinese for their hardwork and economic development. The Dalai Lama was speaking after paying his tribute at the memorials of Rashtriya Swayamsevak Sangh (RSS) founder Keshav Baliram Hedgewar and its second chief M. S. Golwalkar in Nagpur, Maharashtra. The Dalai Lama also said he has always admired Chinese people residing in different parts of the world. "At this moment we are passing through difficult sort of moment. However, Chinese people, I always admire. Hardworking, realistic, you can see in different parts of the world wherever there are Chinese communities they are economically quite well," he said. Beijing considers the Dalai Lama, who fled China in 1959 after an abortive uprising against Chinese rule, a violent separatist. The Dalai Lama, who is based in India, says he is merely seeking greater autonomy for his Himalayan homeland. The Dalai Lama also said that India has a great potential to contribute to world peace. "India, you see really, I see has great potential to contribute to world peace, a healthier world," he added. Hailing India's democratic system, the Dalai Lama said the nation's democracy is stable due to its 1000-year-old tradition. "It is the most populated democratic country and since independence, this country, in comparison to other neighbouring states, is very-very stable because of democracy and democracy is very successful because of a thousand-year-old tradition. Different view but respect, I think that's a healthy sign," added Dalai Lama. Violence has flared in Tibet since 1950, when Beijing claims it "peacefully liberated" the region. Many Tibetans say Chinese rule has eroded their culture and religion. They are agitating for the Dalai Lama's return from exile in India, and genuine autonomy for their homeland. The Chinese government denies trampling Tibetan rights and boasts of having brought development and prosperity to the region. As shocking as the first suicides were, the people who chose to burn themselves did so, Tibetan scholars say, in reaction to specific instances of abuse at particular monasteries. Tibetan Buddhist monasteries are often under surveillance and subject to raids by Chinese security forces. Since 2009, at least 121 Tibetans have set themselves on fire in China in protest against Beijing's policies in Tibet and nearby regions with large Tibetan populations. Most were calling for the return of the Dalai Lama.